Keith Schaefer from the Oil and Gas Investments Bulletin posted an update on Lynden Energy today. He states that Lynden is open to both a corporate deal and selling off assets. We believe that monetizing the Wolfberry assets would be worth potentially $200 million (LVL's current market is cap is about $100 million) and Schaefer states that that would be a realistic transaction price. 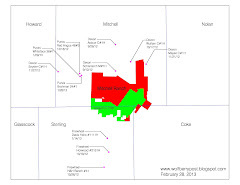 Schaefer also states that a private company has hit a 1,000+ bopd well just a few miles south of Mitchell Ranch. We believe that he is referring to one of the Firewheel/Oxy wells, either the Horwood #2151H or the H&H Ranch #41 well. There is a lot of permitting activity surrounding the Mitchell Ranch area due to the abundant interest in the Cline Shale. We believe that Schaefer's estimate of value for Lynden's Mitchell Ranch of $2,000 to $3,000/acre is low. A valuation of $7,500 to $10,000/acre is entirely possible in the near future which could add $250 to $350 million of value. We believe that exciting times are ahead for Lynden!